Only five species of rhinoceros are left on Earth. 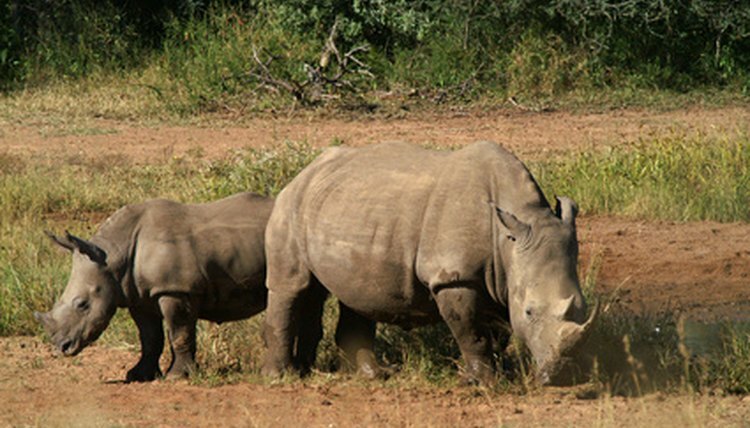 Rhinos, herbivores, are endangered because deforestation, agricultural encroachment and poaching, or illegal hunting, have devastated their numbers. The five species left are the black rhinoceros, the white rhinoceros, the Sumatran rhinoceros, the Javan rhinoceros and the Indian rhinoceros. As recently as the 1970s, the black rhinoceros population was around 15,000, the largest among rhino species. Endemic to sub-Saharan Africa, their range has been severely reduced since, resulting in an 85 percent decline. Wiped out in most of central Africa, only 2,520 are left today. These drastic changes and their causes have affected black rhinoceros eating and sleeping patterns: It has become mostly nocturnal. Feeding early in the morning and evening, it sleeps in the shade of thickets to avoid the daytime heat. Black rhinos sleep either standing up or lying with their legs curled beneath them. Some even sleep lying flat on their sides. Currently restricted to game preserves and national parks, the white rhinoceros is the only one of the five species that tends to travel in groups, called crashes. They feed in early morning and late afternoon, and rest during midday, when it's hottest. At night, they alternate between eating and resting. White rhinos sleep lying down, rather than standing, and they seek shaded areas. Unlike the black rhino, the white rhinoceros will never sleep lying on its side. Periods of sleep and rest vary by season, temperature and cloud cover, ranging from 1.5 to 3 hours up to 10 hours. The Sumatran rhinoceros is critically endangered. It is the smallest of the five remaining rhinoceros species. It's the only one with hair on its body, so it's called the hairy rhinoceros. The Sumatran rhinoceros has lost 50 percent of its numbers to poaching alone, not to mention drastic decline because of habitat loss as human populations encroached on their forests. Fewer than 300 Sumatran rhinos are alive today in isolated pockets of Southeast Asia. The Sumatran rhino typically sleeps and lives in dense rain and moss forests. It can sleep lying down or standing up. Today, the rhino is observed in forest clearings. The Javan rhinoceros is critically endangered; only 60 to 100 remain in the wild. They once lived throughout Southeast Asia, from Burma to Sumatra, but thanks to poaching and humans encroaching on their habitat, they are now found only in the dense tropical rain forest in Ujung Kulon National Park on the island of Java and in Cat Loc Nature Reserve in Vietnam. The Javan rhino once preferred to feed and sleep in grasslands and floodplain, but it has been pushed to higher ground. The one-horned Asian herbivore sleeps, lying down or standing up, in the protected parks. The endangered Indian rhino has been able to rebuild its population despite the remaining problem of poaching. Its habitat was reduced drastically. Eighty to 100 Indian rhinos are found in Nepal and several hundred in northeastern India. Thanks to conservation efforts, Indian rhinos now number 2,520. They sleep either standing up or lying down and feed in the floodplains of large rivers, swampy and tall grass areas, reed beds, grasslands and wooded meadows in Nepal and northeastern India.